Peruvian Gold’s Bloom Rush is a liquid fertilizer developed to provide additional phosphorus during the flowering / budding stage. Provides the nutrients needed to promote vigorous blooming / fruiting. Derived from Winterfalls’ composted llama manure, fossilized seabird guano, and artesian well water Bloom Rush naturally provides readily available nitrogen, phosphorus, and potash needed to support the plants growth through bloom. Bloom Rush is important for the energy systems. It stimulates early growth, root formation, promotes seed formation, and is important in photosynthesis. Phosphorus is involved in the formation of all oils, sugars, starches, etc. It also encourages blooming and root growth. A plant deficient in phosphorus grows slow, has stunting, and purplish color on foliage. Plants treated with Bloom Rush grow more vigorously and mature earlier than plants not treated with Bloom Rush. 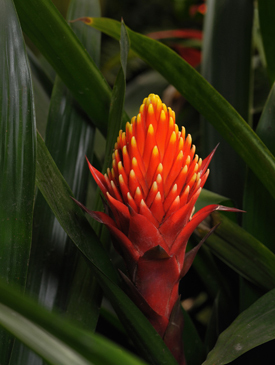 Bloom Rush supports the plant energy transfer, nutrient transport and photosynthesis. Due to the accelerated flowering growing systems using CO2 may require addition nitrogen to support accelerated growth during bloom. Plants and trees treated with Bloom Rush begin producing flowers 48 – 72 hours after application. Combining the fossilized seabird guano with our Liquid Copal produces a great phosphorus fertilizer. When amending soils it is not necessary to dig down to the roots of the plant or tree, Soil drenching is adequate. Bloom Rush will not clog hydroponic systems, requires agitation while distributing. Phosphorus is one of 17 nutrients necessary for optimum plant growth, seed production, and photosynthesis. Phosphorus enters the plant through root hairs, root tips, and the outermost layers of root cells. Plants that have a deficiency of phosphorus experience, Slow growth, stunting, and purplish color on foliage or dark blue/green color, (due to inadequate carbohydrate utilization); dying leaf tips; marginal *interveinal chlorosis; delayed maturity, poor fruit and/or seed development. It is most common in areas of high rainfall, especially in acidic, clay, and hardpan soils. 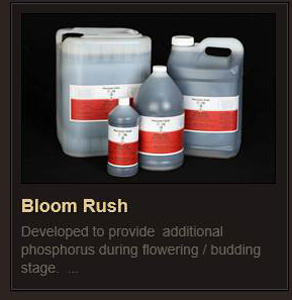 Bloom Rush provides your plants with readily available phosphorus to assist in plant energy reactions, early growth development, photosynthesis, and the formation of all oils, sugars, and starches. Derived from Winterfalls’ composted llama manure, fossilized seabird guano, and artesian well water Bloom Rush naturally provides readily available nitrogen, additional phosphorus, and potash needed to support the plants growth through bloom. Used as directed Bloom Rush is safe for all your growing media, from the vegetable garden outside to the greenhouse hydroponic system. Available in 32 oz, 1 gal, 2.5 gal & 5 gal containers. Large amounts available special order. Phosphorus is an important plant macronutrient, making up about 0.2% of a plant’s dry weight. It is a component of key molecules such as nucleic acids, phospholipids, and ATP, and, consequently, plants cannot grow without a reliable supply of this nutrient. Phosphorus is also involved in controlling key enzyme reactions and in the regulation of metabolic pathways (Theodorou and Plaxton, 1993).